Extra voltage shot through J's home, burning up his ceiling fans. Crutchfield photographer J Stoll came home to a big surprise. J hurried from room to room looking for fire. He flicked the light switch as he entered the kitchen. The bulb flashed on and instantly went out with a loud POP. With no return path for the current, the two hot wires pumped 240 volts throughout J’s house. Anything that used 120 volts received twice the power it could handle. 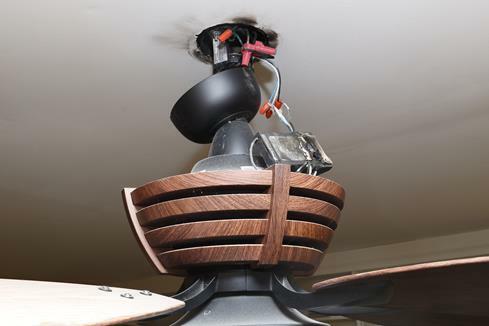 The ceiling fans whipped around at a violent speed until they burned out. The Monster in-wall surge protector sacrificed itself, saving J's TV. A few days later, the power company turned J's power back on. Time to find out what worked and what didn't. Items plugged directly into outlets were lost. The list included four ceiling fans, the stove, microwave, washing machine, and refrigerator. J’s wall-mounted TV was plugged into a Monster Power in-wall surge protector. 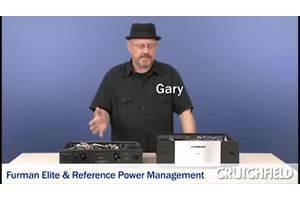 His A/V receiver, cable box, router, modem, and Blu-ray player were connected to a Panamax MR4300 power line conditioner. All of these items survived. The MR4300 uses a Panamax exclusive technology called “Automatic Voltage Monitoring.” It continuously monitors the amount of power coming in. When it sensed too much voltage, it switched off AC power to J’s gear. 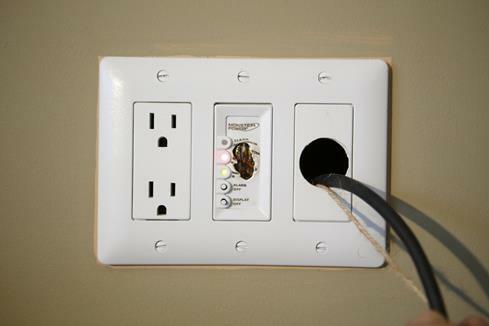 J’s Monster in-wall outlet “took a bullet” to save his TV. While the outlet was rendered useless, it did its job and diverted the voltage away from his television. The Panamax survived, and continued to work after power was restored. 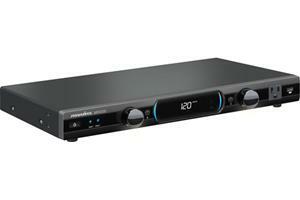 The Panamax MR4300 included "Automatic Voltage Monitoring" technology. 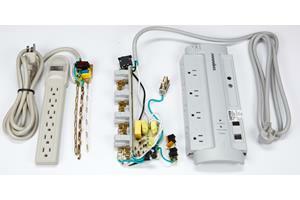 Surges often enter and move around homes through the phone, Ethernet, or cable/satellite line. J ran these connections through his Panamax, protecting another pathway to his TV. The power company labeled J’s power event as an “act of nature” and would not pay for any of the damage. His insurance company covered the damage to the appliances and ceiling fans. The audio/video electronics, had they not been saved by the power protection, would not have been covered. J tallied up the cost of the protected gear. His $350 investment in power protection likely saved him well over $3,000. But it wasn't just the money. J recalled the time and effort it took to replace the appliances. "I'm relieved," he said, "that I didn't have that hassle with the electronics." Kenneth Jamrozy from Harrison Twp, MI. The grounding electrode used to be the cold water system as that not only provided a convenient place to connect the service ground conductor, but was effective by it's contact with the earth as it entered the premises. As the plumbing systems in the home transitioned to PVC it became necessary to supplement the grounding system with ground rods. There are actually two grounds referred to in the NEC which are distinguished by their purpose. The service ground is to prevent or bleed off voltage higher than normal such as spikes and lightning strikes. 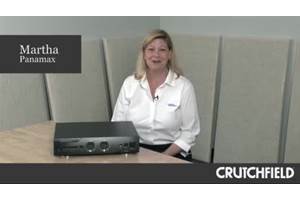 Whereas, the equipment ground while being connected to the frame of your appliance is meant to prevent any potential above ground thereby protecting you from injury. It is commonly thought that the neutral/white wire is the same as the bare copper ground wire. They are considered two seperate and distinct systems and have only one bonding point in the service panel. It is a common mistake to land the neutrals and grounds in the same place in the panel. There must be two seperate entities, a neutral bar and a ground bar. The neutral or white wire carries the same voltage as the hot or black wire. Opening up a wire nut and interrupting a live circuit can result in serious injury if you happen to find yourself in contact with a grounded surface while touching one of the wires carrying a load or get between them completing the circuit. It is always better to have protection, but it's apparent J's home was not wired properly. Had J's service entrance been properly grounded in accordance with the National Electric Code, the damage would not have occurred even with the loss of the neutral wire. That would have been J's responsibility and the extra cost of having the equipment installed to meet code would have been small compared to the damage sustained from an improper installation. A neutral connection can be lost due to many reasons. Most power companies will not connect to a service that is not installed according to code. I'm not sure how the power company justifies the "act of nature" label. "Nature didn't put that neutral wire in the circuit that J paid the power company to use to supply him power. J paid the power company for 120/240 service on an understanding that the power company would maintain the equipment that belonged to them and J would maintain the equipment that belonged to him. The point of demarcation is the meter. The power company knows, or should know, that each piece of equipment has an expected service life. Regular maintenance and inspection is part of the operation of any company operating physical equipment.